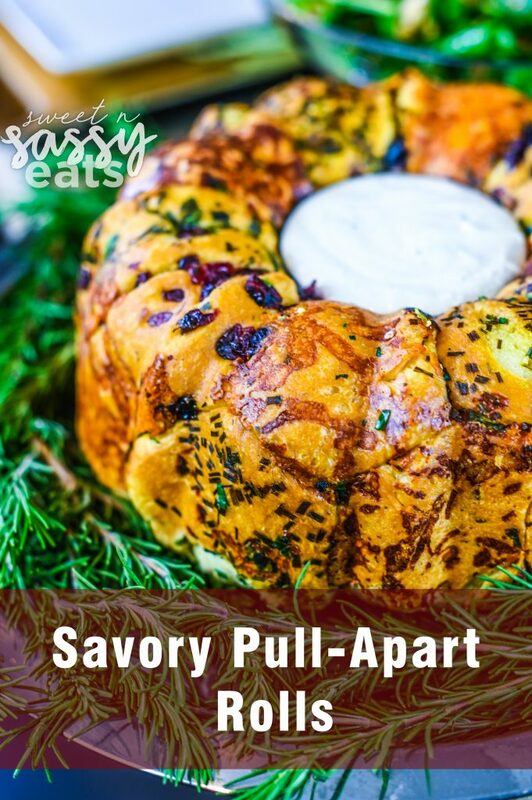 This savory pull-apart roll recipe will be a hit in flavor and in appearance, always a winner at your holiday table! For as long as I can remember my family has been enjoying our Orange Glazed Dinner Rolls for every special occasion/ holiday meal. This Christmas I decided that this year I would switch it up a bit. I wanted it to be something that resembled a Christmas Wreath to help the whole meal look extra festive. 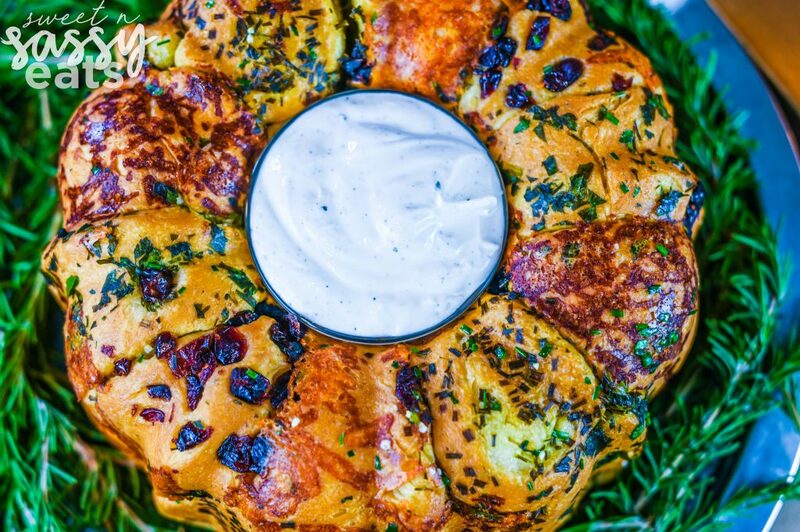 So I took the idea of “sticky buns” or “monkey bread” that is a sweet, sticky cinnamon roll round shape loaf that has individual pieces you can pull-apart and share with your friends and family. With that concept in mind, I grabbed a bunch of fresh herbs, cheese and cranberries to help make my vision come to life. 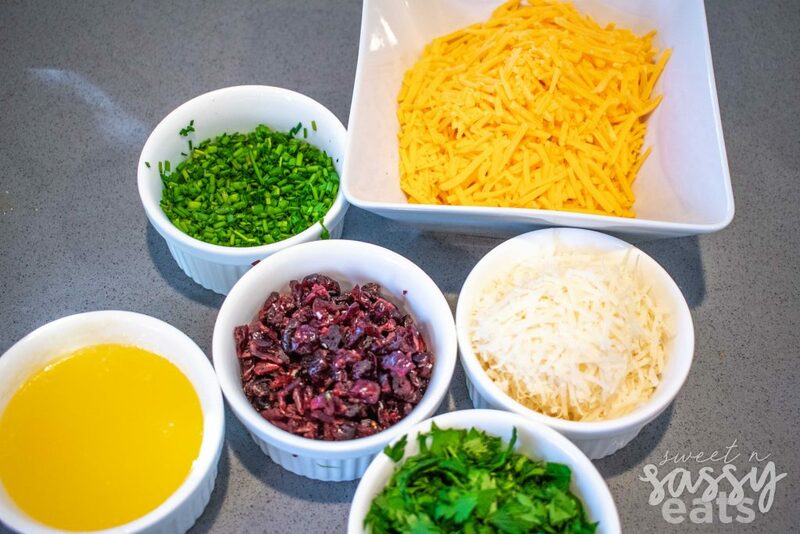 You can totally mix up the fresh herbs, cheeses, and dried fruit (you can even add chopped nuts), to coordinate with your meal or with what you have on hand! Make a little garlic butter to dip and BAM! So delicious! This masterpiece is super simple to put together, but will amaze everyone at your table. 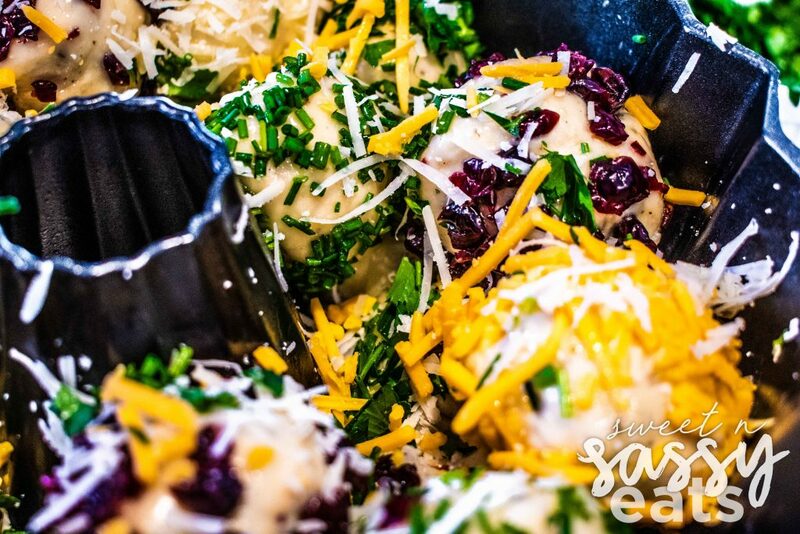 To make sure your dough balls are equal, weigh your dough and then break it up into 24 even parts before shaping them. Make sure that when you are layering each roll that you alternate which flavor you put down so that the same flavor doesn’t touch the other. Make sure you have a good thermometer, so you can check the internal temperature and know for sure when your wreath is cooked through. I use my Thermapen MK4 to check the temp. I aim for a 185 degrees internal temperature. If your budget isn’t quite ready for that one, I also recommend their ThermoPop, it is very accurate but just takes slightly longer to read the temperature. I made a simple ranch dip to allow my guests to dip their rolls into if they’d like. You can also do a marinara sauce, a hummus, garlic butter … the possibilities are endless. I am so excited to see these beauties show their faces on your holiday dinner table! Make sure to let me know if you try it out! Once it has completed it’s rise, remove from fridge. Pour dough out onto a floured surface. Knead a few times to get a smooth ball. 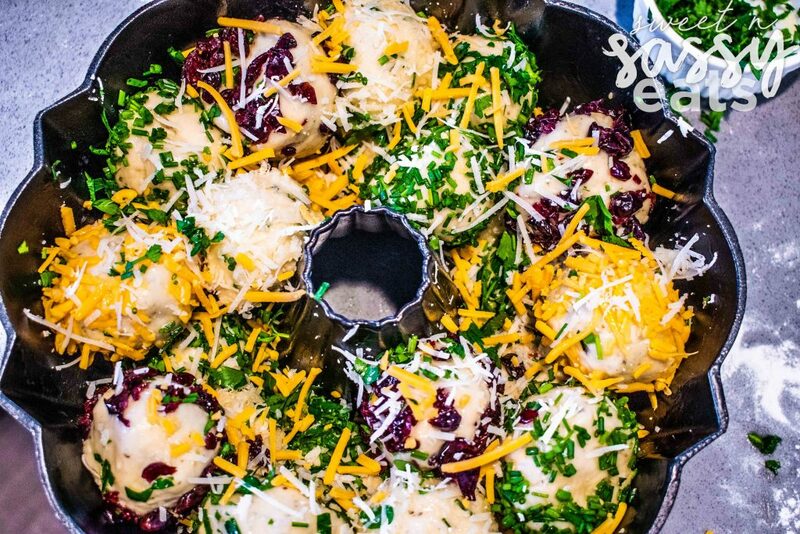 Separate into 24 even pieces and gently form into round balls. Grease a non-stick bundt pan. Mix minced garlic into melted butter. 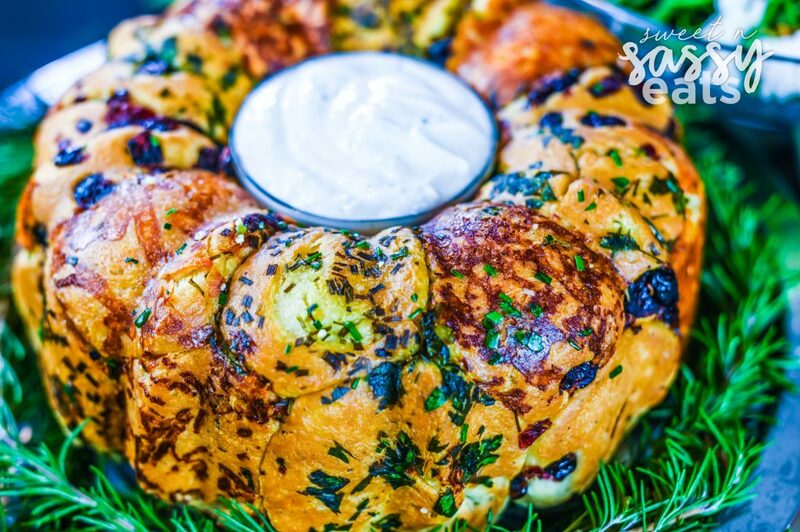 Dunk each dough ball into the garlic butter then into desired herb, cheese or dried fruit. 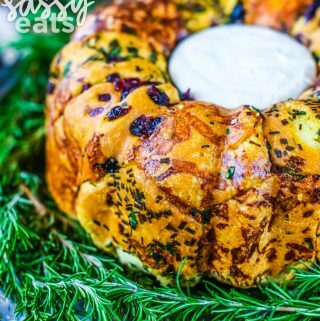 place into bundt pan and alternate each flavor. Once all are in the bundt pan, cover with a cloth and allow to rise for 2hrs. Preheat oven to 350 degrees. Brush with melted butter and bake 15-20 minutes or until cooked through. Use an instant-read thermometer, rolls are cooked perfectly once they reach an internal temperature of 185 degrees. Remove from oven, place a thin spatula in the side to loosen from bundt pan while still warm. 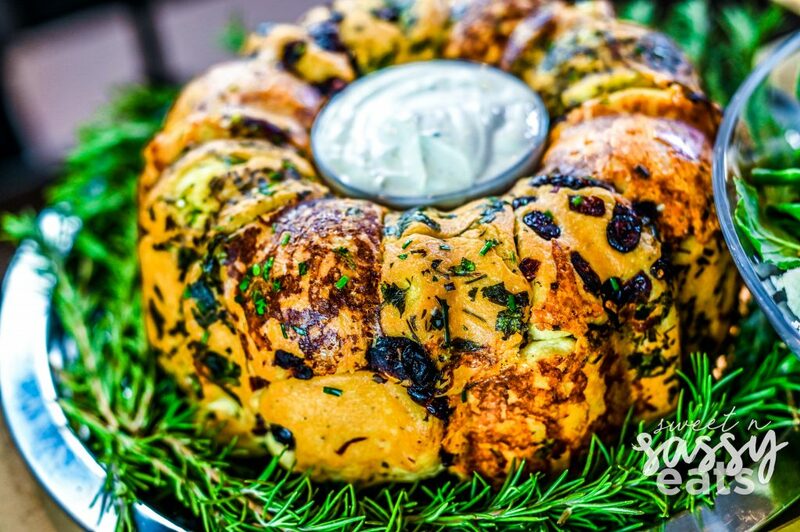 Place a serving platter on top of the pan and then flip the bundt pan over and hopefully, it releases from the pan. Serve with a dip of choice in the center.